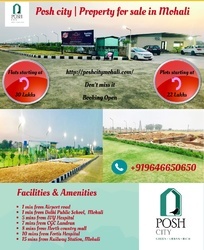 The #poshcity is one of the #famous developing #areas in #Mohali with best services.These #plots & #Flats are #offered for #sale in #sector 91-92 #Mohali, #Chandigarh. The #society is #well #attached to different #methods of #transportation. The #peaceful and lavish #area where the #different colors of life can add vibrancy to perks. This #location only 1 mins from (DPS) #Delhi #Public #School, #Guru #Nanak #Foundation #Public #School and 5 mins from #IVY #hospital. Take most effective #opportunities and exclusive #offers on purchase #Flats, #plots. #Residential #plots available in all #sizes. #Plots having Size (112,125,150,200,250) Sq.Yd. The #plots are starting from 22 lakhs only & #Luxury and #Spacious #2BHK & #3BHK Independent #floors only 30 #lakhs.